There are few places these days where one can go to catch a vintage steam locomotive in action. 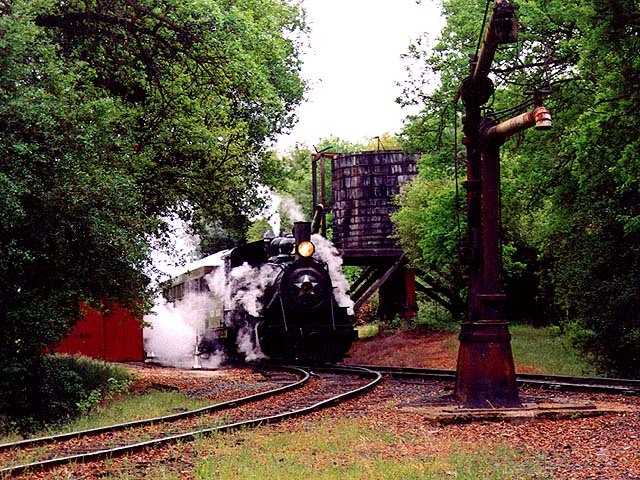 Fortunately for us, one of those places is not far from our home -- Railtown 1897 Historic Sierra Railroad Shops and Museum located in Jamestown in the heart of California's famous Gold Country. 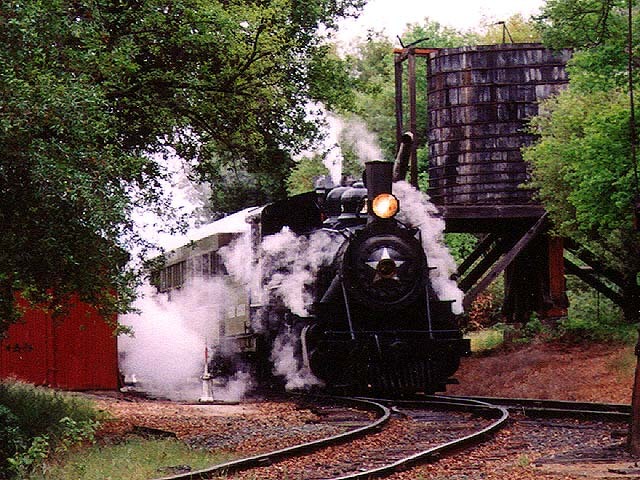 Constructed as a short line mountain railroad before the turn of the 20th century, the railroad survives as both a tourist and freight railroad. 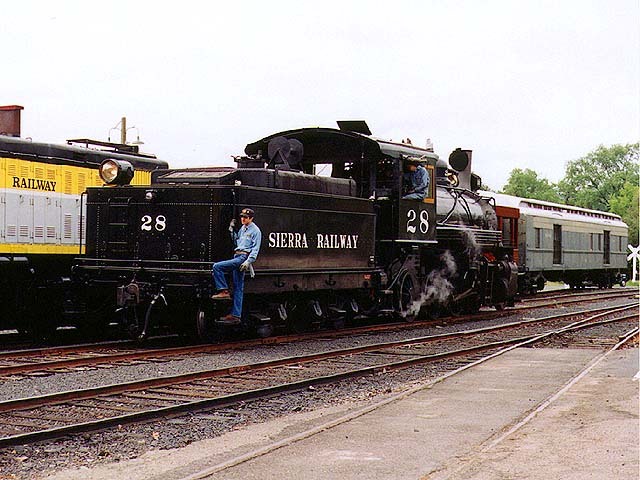 The Sierra Railway (SERA) uses Jamestown as its eastern base, with trains traveling as far west as Oakdale. But you'll generally only find diesel power running on the mainline these days. For steam action you have to visit the museum and tour the old roundhouse or, better yet, take a 40-minute excursion ride on a working part of American railroading history. 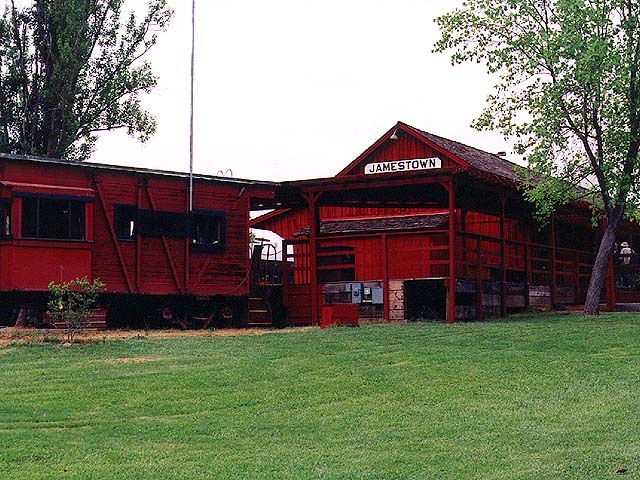 Steam trains depart the Jamestown depot several times every weekend day during spring and summer. Railtown is affectionately known as "The Movie Railroad" because its trains have appeared in dozens of Hollywood movies, commercials and TV series. It is easy to see why it is one of the most photographed railroads in the world. 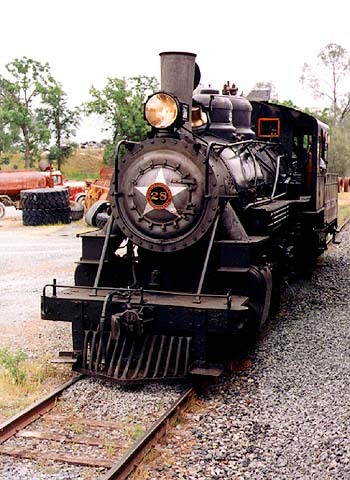 If you would like to learn more about the museum and its history, we suggest you follow this link to the California State Railroad Museum's web site. May 2, 1999, marked our son Benjamin's fifth birthday and our second visit to Railtown. Shortly after our arrival we were greeted by the No. 28, a 1928 Baldwin 2-8-0 Consolidation. It paused at the end of an excursion run to take on water at "Petticoat Junction." Yes, the tower appeared in the TV series of the same name. Photo by Roni Gehlke. A closeup view of photo #1. Photo by Roni Gehlke. Its water tender filled, No. 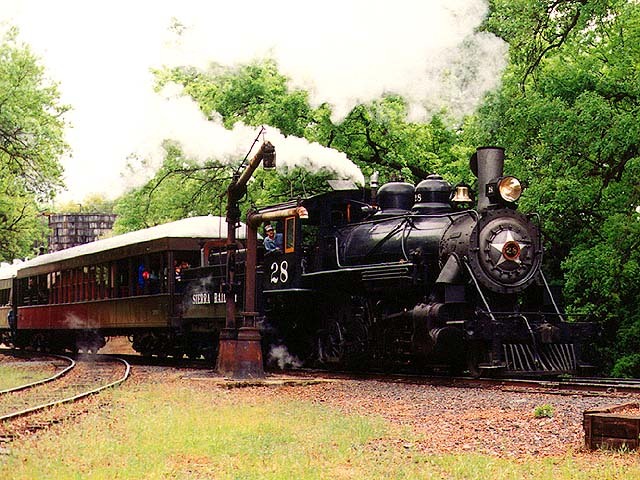 28 steams on toward the Jamestown depot. Photo by Roni Gehlke. This guy has the best job in the world and he seems to know it. A peek into the cab of No. 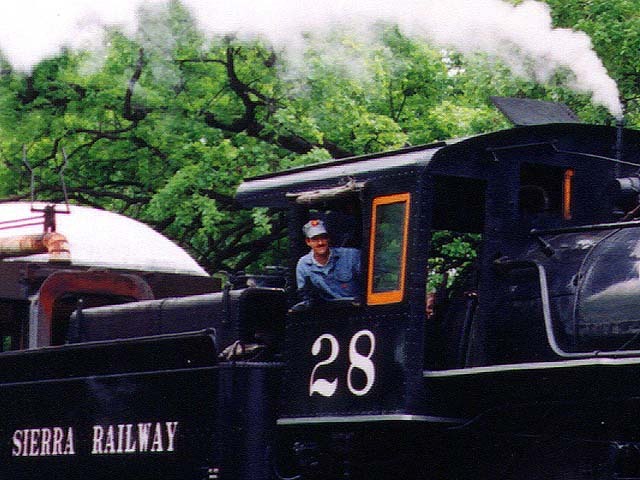 28 reveals the confident look of a seasoned steam locomotive handler. Most of the fellows working in the cab at Railtown on this day were on the young side, but that's probably not much different than the way things were 100 years ago. Photo by Roni Gehlke. There is no wye at Jamestown and the lone turntable was occupied during our visit, so No. 28 ran tender-first for the first half of each 40-minute excursion trip. Here the crew backs the locomotive off the mainline and onto the runaround track so it can couple up to the opposite end of the train. Photo by Roni Gehlke. 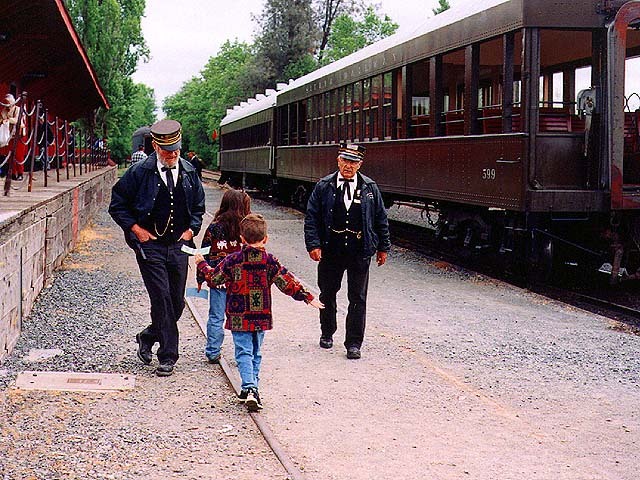 Two young Railtown visitors find their own "runaround track," passing between a pair of conductors in period costume. One of the charms of a steam excursion ride here is that all the docents travel in costume. Stepping on board one of the old time coaches is like stepping back in time. Photo by Roni Gehlke. At the midpoint on our journey, No. 28 uncouples and runs around the side of the train to face forward for the three-mile trip back to Jamestown. In the distance is a gravel quarry, providing perhaps the least pictuesque scenery along the short route. Photo by Roni Gehlke. 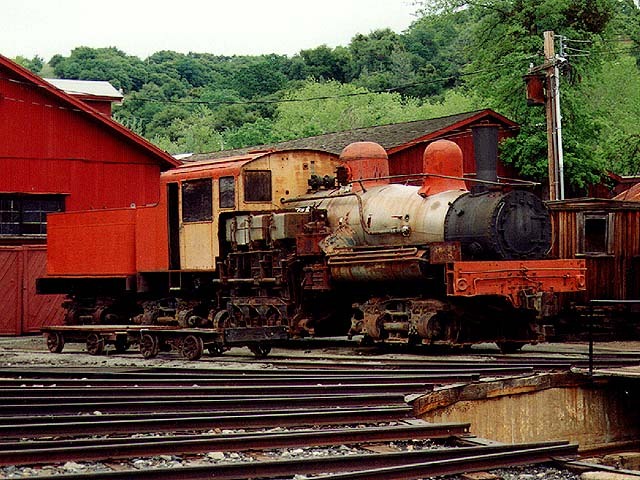 This little Shay locomotive has seen better days, but it does make a colorful photo subject as it sits on a track behind the historic Jamestown roundhouse. Photo by Roni Gehlke. 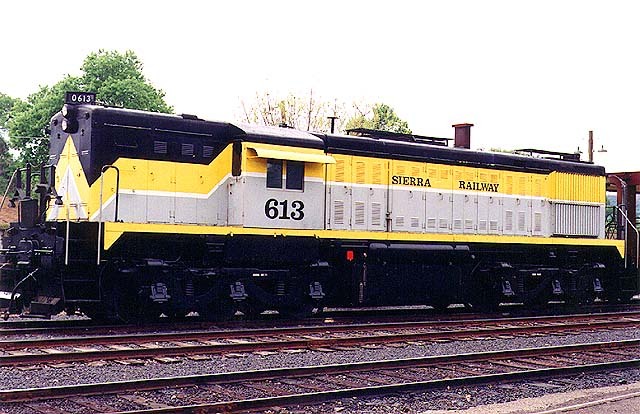 SERA 613 is an Alco diesel electric locomotive built in 1953. Its former home was at the Concord Naval Weapons Station, which is just a few miles from our home at Milepost 1147.2. Of course, it didn't look this classy when it worked for the military; it was repainted in 1995 for a Chrysler minivan commercial. Photo by Roni Gehlke. 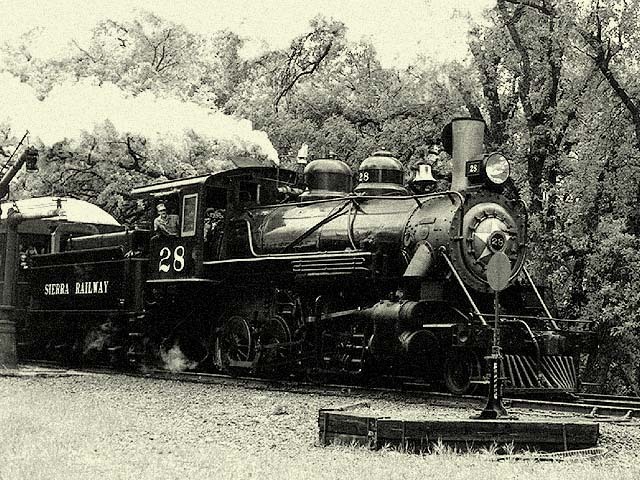 There's just something about steam locomotives that lend themselves to black and white photography. We weren't shooting b&w during our visit, so we did the next best thing -- zapped out the color in Photoshop and gave it an antiqued look for effect. If you didn't know any better you could almost swear it's 1929 and not 1999. Photo by Roni Gehlke. This page was last updated Tuesday, May 11, 1999 at 22:45 hrs.